For centuries Masonic historians have been puzzled by the motives for, and the purpose of, the formation of the craft of freemasonry, both in its operative, and speculative form, and whilst endeavouring to investigate the mysteries surrounding the formation of our order, it seems that the riddle actually forms itself into three distinct questions. Who were the original Freemasons, from whence did the order arise, and when? These in themselves are difficult questions enough to answer, and although it is certain that the true origins of Freemasonry are shrouded in mystery and isolated in centuries past, there IS evidence to prove that our fraternity is the most ancient and honourable society of men in the world. Ancient indeed, and honourable it must be acknowledged to be, as illustrated by this quote from the charge after initiation... "no institution can boast a more solid foundation than on that which Freemasonry rests, the practice of every moral and social virtue and to so high an eminence has its credit been advanced, that in every age even monarchs themselves have been promoters of the Art....."
At our initiation we are instructed that the first members of the order were employed in the construction of King Solomon's Temple, though many believe that the order actually owes its origin to the same causes as the later trade guilds and associations of the middle ages, BUT a wide variety of circumstances combined to give it an influence and significance above and beyond any other fraternity or brotherhood of men. Whatever its origin, it CAN confidently be asserted that no other society has, at any time, attained the character, dignity and integrity that distinguishes Freemasonry from all others. Since modern Freemasonry is spread world-wide, it would indeed be surprising if there were not many points of contact with a variety of religions and cultures, in addition to the classical mysteries, and even possibly ancient Chinese philosophy, in which for example, the square and compasses are believed to have been employed as an illustration, or emblem, of morality. For example it is reputed that in the Book of History, which is thought to be the oldest of the Chinese classics which dates back centuries before the birth of Christ, it was written " A Master Mason, in teaching Apprentices, makes use of the compasses and square. Ye who are engaged in the pursuit of wisdom must also make use of the compasses and square", BUT although many of the doctrines and beliefs inculcated in freemasonry have been found in many different parts of the world, and in very diverse civilisations, there has never been any convincing evidence brought forward to actually PROVE the lineal decent of our craft. Nevertheless from the little we know of the Craft in the centuries prior to the formation of the first Grand Lodge of England in 1717, it seems highly unlikely that there was any parentage at all from any ancient civilisation, indeed, it can very plausibly argued that a great deal of the symbolism which we find today is actually a comparatively modern feature, and that some, if not most, were not introduced until after the eighteenth century. In the attempt to trace the roots of Freemasonry, we should at least go back to the Middle Ages, where there was undoubtedly an association of operative stonemasons in this country. These superb craftsmen built the marvellous cathedrals and abbeys of England, carrying out skilled and delicate work, carving the superb pillars, arches, vaultings and friezes which are the glories of the English Gothic Cathedrals. Going even further back in time, to what is called the Dark Ages, the masons employed in the construction of the earlier churches and monasteries of our land were no less skilled, and possibly even of some education, since they would no doubt, have had to read some sort of plan or drawing, and this education, no matter how trifling, would have lifted them above the ordinary serf or bondsman. These same masons were often exempted by Papal Mandates, called Bulls. from the laws affecting common labourers, who were normally tied to the land and owned by the lord of the Manor. The mason therefore could, and probably would be proud, to call himself a free man, for the very essence of his employment must have kept him on the move, as the work of building in any one place, must, eventually come to an end, and the "free" mason would then move away to another place of work, to assist in the erection of another cathedral, abbey, or defensive fortification. The mason would probably have had to travel far in search of his next employment, and so would probably have found himself in the company of complete strangers, and so to enable him to claim work without having to undergo a another test of skill or qualification, a system of signs and symbols could have been devised, in which every mason was initiated, by which he would be easily tested to satisfy his peers that he was familiar with the established usage's and customs of the craft, and to which he was bound by solemn oath, to keep secret. This particular argument offered by some Masonic historians on the origin of the word Freemason could very plausible but there is another possible explanation which I will consider shortly. An important question for the travelling mason would be that of lodgings and community meeting place, and what would be more natural than for the masons to erect, near the intended building, a smaller building or "lodge" where they could live and work as a community whilst their employment lasted? The word lodge is a thought to be a derivative of a Norman word meaning a shed or small building, and in some parts of England a workshop, shed, or hut is still called a lodge. The earliest known reference to the word occurs in 1277 in the building accounts of Vale Royal Abbey. It is also found in the "Fabric Rolls" of York Minster dated 1355 - in these, the following orders for the masons. ....."Then to breakfast in the fabric of the lodge, and forthwith all are to return to work until noon. Between April and August they shall sleep in the lodge, then work until the first bell for Vespers". During the many years it would take to complete the vast buildings of the age, they would undoubtedly have been in daily contact with the Abbot and monks of the Abbey, or Canons of the Cathedrals who had prepared the plans, and who would continually supervise the work, and accept or reject the material or workmanship during the construction of the building. With such daily contact with the clergy the mason would obviously acquire a touch of the ecclesiastic about him, and would look to the clergy for spiritual guidance, just as the churchman would look, in turn, to the mason for guidance in the matter of building technique, and each would take an interest in the affairs, and well being of the other. One body of monks who interested themselves in the doings of the masons were the Culdees. Prior to the ninth century the Culdees were originally of the Celtic Doctrine, but were later forced to conform to the usage's of the Roman Church and consequently the order died out in England around the fourteenth century. At their peak the Culdees were most prominent in Scotland where they had monasteries in St. Andrews, Dunkeld and Lochleven. They had members also in Ireland, but it is the body which established itself at York which most concerns us. These particular members of the order certainly interested themselves a great deal with the masons who were engaged in the building of the first Minster at York, of which they were in charge in the days of King Athelstan. Athelstan, son of Edward the Elder and grandson of Alfred the Great, was king between 925 & 941 AD. Himself a worshipper at York in the years around 936, he gave the Culdees certain grants of land as a thanks offering for his successes in battle, notably in subduing parts of Cornwall and Wales, and in 937, defeating the combined forces of the Welsh, Scots and Danes at Bruananburg. It is also reputed in the Old Masonic Charges that he granted a charter to the masons to hold an assembly every year. Unfortunately there is no conclusive evidence of any official organising of the craft at this time, and this legend may be pure myth. The Culdees were at York for several hundred years, certainly up to the year 1200, and it seems probable that from close contact with the monks, the masons would have been taught to look upon their skills as a gift from God, and therefore their everyday tools and implements could be even have been considered as guides to faith. When considering the background of the medieval mason one cannot disregard the Guild system. Many crafts have had their trade secrets and most, from around the tenth century onwards, tended to form associations called Guilds for the better governing of their members, and for the securing of a high standard of technical skill. Masons too had their trade secrets of a technical character, but they were in a distinctly different position from other crafts, the members of which generally followed their trade throughout life in the same locality, therefore the craft guilds were essentially products of communities where members were well known to each other. The mason, on the other hand went where work was available, after all there wouldn’t have been much work for stonemasons within towns, since the buildings there were made mostly of wood and plaster. They were also moved under compulsion, when Royal Castles were under construction, on the Welsh marshes or the Scottish Borders for example. The earliest known King's writ for the impressment of Masons is dated 1333 and for approximately the next 300 years masons could find themselves pressed into service by the monarch. In 1370 Master Henry DE Yevele of Yeovil, and William DE Wynford were each ordered by the crown, to take 50 hewers of stone from London, Somerset and Dorset to Orwell. They had to be ready by 1st May and to quote from the statute " all contrariants are to be arrested and committed to prison". Mostly, but not always though, masons employed by the Church were excepted from the King's Writ, and special bills of protection could be granted by the clergy. One of these notably, was warranted by the Archbishop of Canterbury to masons working on the walls of that city, granting them protection for one year from May 1381. It has also been the hypotheses of certain scholars, that the origin of our craft may well have come from the Steinmetzen, or stonemasons of Germany. This became a popular theory just over a century ago following the publication of the writings of Frederick Fallou in 1848, Joseph Findel in 1865 and Albert Mackey 1874. There was indeed an organisation of operative lodges in the Germanic parts of Europe which were subordinate to the Chief Lodge at Strasbourg, but, although the regulations governing Steinmetsen are well documented from 1457, and their members were also divided into three classes, Apprentices, Fellows and Masters, there is no direct evidence linking this operative order with the speculative one found in Britain, indeed, it is quite certain that stonemasonry in Germany never attained any level of a speculative science at all, until after it was developed in this country. It is therefore quite probable that the system of continental symbolic masonry actually OWES its origins to the one developed in here in Britain, and this was then transplanted to the continent some years later. The economic changes of the fifteenth and sixteenth centuries and especially during the reign of Henry V111 culminating in his dissolution of the monasteries in 1536 and again 1539, had far reaching effects on the Masonic craft. At this time the building of the great monasteries had ceased, and church building had also declined, due to the less ornate classical type of architecture being introduced. So it was that the membership of operative lodges declined, which in turn, gave reason for, and encouraged the membership of non masons, and the beginning of the transition from operative to speculative Masonic lodges. This time of transition is the link which joins the present with the past. We can imagine the original stonemasons who came to the Lodge in their aprons of leather and brought with them their working tools, which they placed before them. The Master of the Lodge may have been able to read, and if so, he would no doubt have read from the Ancient charges, which were treasured in the Lodge, or, if he could not read, then he would recite as much from memory as he could, having been passed down by word of mouth for generations. After a time, when education became more general, a superior class of men were found in such lodges, and a short ritual could have been learned, this indeed would be the forbear of our own ritual we use today. Later, In Tudor and Stuart times, we do find masons formed into actual guilds or Companies of Masons, often in the company of other building trades. The books of the London Masons' company of 1619 are still in existence, and it is from about this time we find traces of Lodges and other bodies, as well as individuals, who are not actually connected with the operative craft of masonry. These would later be called speculative masons, but, although the word is first used around 1425 it was not in general use before the middle of the eighteenth century. Thus we have a picture of an entirely operative craft up to the middle of the sixteenth century which gradually, and eventually, gave way to a predominantly speculative form of freemasonry by the middle of the eighteenth century. During the Middle Ages the system of apprenticeship was of course well known and used in many trades and crafts, but it actually seems to date from as early as the thirteenth century, the earliest known regulation being dated about 1230, although nearly a century passed before it began to be insisted upon and come into general use. The apprentice's full freedom came some years after indenture, when he became a Fellow (of the) Craft, he was then regarded as being fully qualified with respect to membership of his trade. In English documents the term Fellow was first used in the sense of, one of a body or member of a fraternity, and held no significance in either grade or status, but it was later used in operative craft regulations with the implication, that the Fellow was of a status superior to that of a mere mason. Although the entered apprentice, was actually a feature of Scottish operative Masonry at least as early as 1598, the term was not heard of in English speculative masonry before the first Book of Constitutions, which was written in 1723, of one of the authors being a Scottish clergyman, the Reverend James Anderson. Also notable was the introduction of several other terms from Scottish operative masonry, such as Fellowcraft, rather than Fellow of the Craft, and the word Cowan. The Cowan was first heard of in the Scottish Schaw Statutes of 1598. These statutes were codes of practice and rules for operative masons drawn up by William Schaw, Master of Work and General Warden of Masons appointed in 1584 by James V1 of Scotland . The word Cowan is described in the New English Dictionary as "one who builds dry stone walls", and it was applied as an insult, to one who does the work of a mason, but had not been regularly apprenticed to the trade, hence he was a working mason who had not properly joined the fraternity, not having been properly admitted into a lodge through failing to serving his term under indenture, for one reason or another. No doubt there would have been many such men capable of doing fine work, but the official attitude to them is clearly indicated by the following regulation from the Schaw Statue, "That no Master Mason or Fellowcraft receive a Cowan to work in his society or company, nor send any of his servants to work with Cowans under pain of twenty pounds. The term Master or Master Mason applied almost up to the eighteenth century to the Mason in charge of building operations, indeed he would be in sole charge, actually designing the building, procuring the material, and personally directing the whole of the work, doing the job of architect, surveyor and builder. He was the most important man in the building craft for several centuries, being in charge of all stonemasons employed in the construction of the building and treated with marked respect. Consequently he had the status applicable to a professional man of good standing today. In Bury St. Edmunds for example, the Master of Masons received board and lodgings in the Convent Hall, for himself as a gentleman, and his servant as a Yeoman. Masons also served the medieval kings in the capacity and with the title of Master of the King's Masons The earliest example in this country being Henry of Reynes who was King's Master Mason from 1243 until 1253 and served Henry 111 at the building of Westminster Abbey, of which he is regarded as the architect. He was followed by John of Gloucester, who was King's Master Mason during the construction of Westminster Hall in the years between 1254 and 1262. If we look at the earlier suggested origin of the word Freemason again, I personally think it highly unlikely that it would it be possible for a mason to be completely free During the era of the feudal system, since the only free men would be the nobles or landed gentry or possibly wealthy merchants, not carpenters, thatchers, masons or any other type of tradesman. Indeed we do not find the word Freemason being used until the end of the fourteenth century. It is more likely that it came from the fact that the mason worked largely in freestone, an even grained, soft sandstone, highly suitable for carving intricate detail, and the term freestone-mason, which is recorded in 1375, would inevitably, it time, be shortened to Freemason, for common usage. There are many English freestones, such as that quarried at Portland. In 1542 the townspeople of Coventry contracted with a Freemason to rebuild their cross of "good, sure, seasonable free-stone of the quarries of Attilborough, or Rounton in Warwickshire". We first hear of freestone in the year 1212 but the earliest known use of the term "Freemason" occurs in 1376, when it implied, an operative mason of superior class to that of a "Rough" mason. The Freemason did the carving, squaring and setting of windows and arches, whilst the rough mason did the less intricate work such as rough shaping and building the walls. By 1507 the term Freemason was becoming become more common. It is recorded that John Hylmer and William Vertue, Freemasons, were contracted to execute the groined vaulting to the choir of St. George's Chapel, Windsor, for £70. Later during the erection of Christ Church College between 1512 & 1517, John Adams was Freemason, and about 1513 during the construction of vaulting in the chapel of Kings College, Cambridge, an ordinance stipulated that John Wastell, the Master Mason, should "Kepe continually 60 fre-masons workyng", but during the seventeenth century a number of examples of the use of the word suggest that it was beginning to be applied to non operative masons. In 1641 we have the earliest recorded initiation of a non operative Freemason on English soil. During the 1st Barons War between Scotland and England during the reign of Charles 1, some members of St. Mary's Chapel Lodge of Edinburgh No.1, who had crossed the border at Coldstream earlier that year and entered England with General Hamilton's Scottish Army of Occupation, initiated into their ranks on the 20th May 1641, the Right Honourable Mr. Robert Moray, General Quartermaster to the Army of Scotland. This was at Newcastle upon Tyne, which was evacuated by the Scots two months later, after which, those responsible reported the facts to the Lodge and the matter was ratified and recorded in the minutes. "1646, October 16th at 4.30pm, I was made a Freemason at Warrington, Lancashire, with Col. Henry Mainwaring of Katchingham Cheshire" (Ashmoles father-in-law). Then followed the names of the Warden and others that were members or officers of the Lodge. It is interesting to note that these men have been identified as being men of good social position, but none were operative masons, providing us the first definite evidence of an English speculative lodge. BUT it should be pointed out that, apparently, lodges in those days did not operate as we do today with regular meetings. It would seem that many lodges were what is now termed as "occasional lodges" i.e. that sufficient masons were called together to hold a lodge for the specific purpose of making new masons, and the lodge existed for only that occasion for which it was called. A further interesting entry in Ashmole's diary, this time for March 10th 1682, states that after the assembly at the Masons Hall, the company dined at the Half Moon Tavern, Cheapside, and the dinner was paid for by the candidate, seemingly a normal practice in those times. After his death in 1692 Ashmole left a historical gold-mine in the 1,800 manuscripts found, and his name lives on in the Ashmolian Museum, Oxford, built to house this precious gift of the first public collection of antiquities in England. Ashmole further noted that on March 11th 1680 he went to Masons Hall, London, when four other gentlemen were admitted into the Fellowship of Freemasons. The host of Ashmole at this gathering was the Master of the City Company of Masons, the foundation of which MAY be put as early 1220 during the reign of Henry 111, although a firm date HAS been established in 1376, during the reign of Edward 111, when the Mason's Company was officially stated by the Corporation of London to be entitled to return 4 members to the Court of Common Council. In 1472 this same company received its Grant of Arms from the Heralds' College, and in the warrant is described as "The Hole Craft and Fellowship of Masons" though in the reign of Henry 1 its title became the simpler one of "The Company of Freemasons." Eventually in 1656, some 7 years after the execution of Charles 1, this same company took the name "Worshipful Company of Masons". Some meetings of this company were called "acceptations" from which obviously comes the term "Accepted Mason" and the members were possibly divided into masons who were "Free" or operative masons and those who were symbolic and were "accepted" into the Company. Were these fledgling speculative Lodes regarded at the time as being the first of the gentleman's clubs, and membership of which would indicate a personage of some considerable social standing, therefore being "accepted" into the company, further testified to a position of esteem and influence within the community? Passing now to the year 1717 , the third year in the reign of George 1, the first of the German Kings of Britain, and the beginning of the House of Hanover. The Hanovarians were staunchly Protestant and ruled Britain for 123 years until the death of William 1V. The house ended with the succession to the throne of Williams niece Victoria. This year of 1717 is the most important date in the entire history of Freemasonry. This was when the first central governing body of English Freemasons was born, The Grand Lodge of England. At this time though it would seem that the fortunes of Freemasonry were at a low ebb, four only four lodges could be found working in London, those that met at the Goose and Gridiron Alehouse in St. Paul's Churchyard, The Crown Alehouse near Drury Lane, the Apple Tree in Covent Garden, and the Rummer & Grapes Tavern in Westminster. These four lodges formed themselves into a Grand Lodge, and on St. John the Baptists day 1717, at the Goose & Gridiron alehouse, the assembled brethren, by a majority of hands, elected Mr. Anthony Sayer, Gentleman, the first Grand Master of Masons. He was duly installed by the oldest Master present. The first book of constitutions was written in 1723, and a second enlarged version appeared in 1738. It was from these humble beginnings that the modern constitution that we know today evolved, with the latest complete revision being in 1940, and the current edition published in 1965. After a time Masonry began to spread around the world, no doubt due to the expansion of the British Empire, and many persons of the highest rank enrolled amongst its members. One of the more notable being the first English Freemason of Royal lineage, HRH Frederick Lewis, Prince of Wales. On March 1737 an occasional lodge was held at the Palace at Kew, and The Prince was made an Entered Apprentice and Fellowcraft on the same day. He was the eldest son, and heir, to George 11, but sadly he predeceased his father and never succeeded to the throne. Although Frederick Lewis didn't appear to be very active within the craft, his influence seems to have created the association between the members of the Royal House which continues to this day. Following on from The Prince, there were many such brethren of noble blood line, such as the Dukes of Montague, Kent and Sussex, and during the reign of George 111, all six of his sons were members. There were also many famous and distinguished characters overseas, such as, in Germany, Frederick the Great, and in America, George Washington, who took upon themselves the obligations. In 1751 a rival Grand Lodge calling itself "The Most Ancient and Honourable Society of Free and Accepted Masons" was formed in London. It became known as The "Ancients'" from their claim that the Grand Lodge of 1717, later dubbed the Moderns, had departed from the original landmarks of the order, whereas they practiced masonry according to the ancient constitutions. By warranting travelling lodges, especially in regiments of the British Army, and Provincial Grand Lodges in the Colonies, the Ancients did much to spread the word of English freemasonry abroad. They also furthered the Royal Arch and various other Masonic Orders. To make matters more complicated still a further two Grand Lodges soon appeared. In 1725 the Old Lodge at York was revived as “The Grand Lodge of All England” but its influence was confined to the counties of York, Cheshire and Lancashire. It existed for about thirty years during which it also gave authority for the formation of a fourth Grand Lodge in 1778 with the unlikely name of “The Grand Lodge South of the River Trent”. This lodge rejoined the premier Grand Lodge ten years later. In all the existence of a further six Grand Lodges can be found, a total of nine in all, and these are expounded in a further research lecture of mine entitled The Grand Lodges of England. So it was that the rival Ancients and Moderns Grand Lodges existed in discordant opposition until 1813 when the Grand Master of the Moderns, HRH the Prince of Wales, later George 1V, was succeeded by his brother Augustus Frederick, Duke of Sussex. ...At that time The Grand Master of the Ancients was the fourth Duke of Atholl, and he resigned, in that same year, in favour of HRH Prince Edward, Duke of Kent. The direct result of these actions being, that 2 Brothers of the Royal Blood line, were each Masters of their respective Grand Lodges. In a few weeks they ended sixty three years of rivalry, signing the Articles of Union at Kensington Palace on 25th November 1813, to form the United Grand Lodge of Ancient Freemasons of England. The first Grand Master was HRH Edward the Duke of Sussex, with The Duke of Kent his Deputy, at this time there being 647 lodges active in England. The French Revolution of 1789 spread panic throughout the governments of Europe. In England particularly, suspicion was cast upon Freemasonry, by the publication of two French books claiming that the Jacobins, led by Robspierre, and the French Revolution in general, had been guided by French Masonic Lodges. This spurred the government in Britain in the 1790's, to passing a number of parliamentary acts, outlawing secret and oath taking societies. In 1799 the Unlawful Societies Act was passed, which could have seen the closing of all Masonic Lodges in England, but prompt action by Francis Rawdon, the Acting Grand Master, and later to be the 2nd Earl of Moira, saved the situation. He had a meeting with the then Prime Minister, William Pitt, and gave an explanation of the whole nature of Freemasonry, including its patronage by Royalty and nobility, and its support of the establishment. His explanation suitably impressed Pitt with the result that Freemasonry was specifically exempted from the Act. Around the middle of the eighteenth Century, the Moderns Grand Lodge raised funds for a meeting place of their own, and on May 1st 1775 the first stone of the new Freemasons Hall in Great Queen Street was laid by the Grand Master Lord Petre, the hall being solemnly dedicated on the 23 May 1776. The craft soon out grew this modest building and a new one was started in 1864 and completed in 1867. Unfortunately after only 16 years a disastrous fire ruined the Temple in 1883, but it was reopened 2 years later and further extended in 1898 and again in 1900. Once more the Craft outstripped the accommodation it afforded, and it was therfore decided in 1919, shortly after the Great War, to erect a new Temple as a Masonic Peace Memorial. The foundation stone was laid on 14th July 1927 by the then Grand Master The Duke of Connaught, in the presence of nearly 8000 brethren, and subsequently dedicated by him on 19th July 1933 on its completion. The building stands on more than 2 acres of ground with the Grand Temple being 120ft in length, 90ft in width and 62ft high. and there are a further 14 lodge rooms. There is one phase in Masonic history which should not be passed over, and that is the hostility that has been incurred from ecclesiastic organisations. Freemasonry has in fact been banned several times by the Catholic Church. 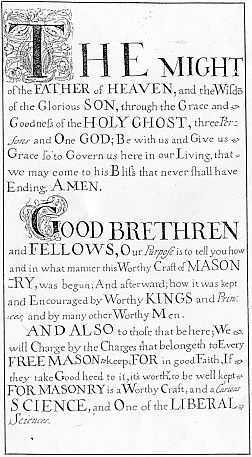 In early operative masonry the guilds were under the direct influence of the Church, and in the first book of masonic constitutions, published in 1723, Freemasons were required to be of the religion of the country in which they lived. The second book, however, published in 1738, altered this and admitted all believers in God, no matter of what persuasion, which brought down Papal displeasure, and in that same year Pope Clement 12th issued his Bull against freemasonry. This was followed in 1751 by another, this time from Benedict 14th, and in 1884 the denunciations of the Roman Church against Freemasons were confirmed by the Pope. Finally in 1974 these Bulls were recinded. The Anglican church too has, through ignorance of our ideals, frowned upon our order, but this displeasure has not of course prevented many worthy churchmen, of any denomination, becoming commendable members of our Craft. Interestingly enough Freemasonry has actually appropriated for itself the title of "The Craft", where at one time the word craft gave the image of a trade or profession, the members of which had special methods and skills to carry out their work or duties. Freemasons now look upon this word as denoting a system of fundamentally ethical attitudes and beliefs, peculiar to our order, which in turn, uses a wide variety of signs, symbols and words in the instruction and advancement of the bretheren.